Key words: Sleep/wake, learning, glia, neuro-glia signaling, metabolism, glycaemia, Notch, Gap junctions, lysosome, blood brain barrier. Which cells and molecular pathways are preferentially affected by extended waking? What are the restorative functions controlled by sleep? How is sleep allowing those restorative processes to take place? These long standing questions remain largely unanswered. Answers to these questions will increase our awareness of the importance of sleep function and may lead to new therapeutic strategies. Our work addresses these questions using a combination of behavioral genetics, gene profiling and pharmacological approaches in the model organism Drosophila melanogaster. Drosophila has been at the leading edge of research in the field of circadian rhythms, neurodegenerative processes, learning and memory, synaptic physiology and can be used as an effective model organism to study sleep function. Sleep analysis in flies is based on behavioural criteria and its automation allows sleep monitoring and manipulation in large numbers of flies. Current projects explore the role of neuro-glia signaling in sleep/wake regulation and learning, an aspect which has been largely ignored in sleep research until recently. We also use the Drosophila model to identify sleep/wake regulatory genes in combination with mouse of models of narcolepsy and somnolence developed by Jian-Sheng Lin in the laboratory. We have a developing interest in the interactions between sleep and metabolism, notably glycaemia, to test hypothesis based on human data. I did my PhD in the laboratory of Pat Simpson in Strasbourg (P. Simpson is now in the department of Zoology, Cambridge university), working on the early neural development in Drosophila. 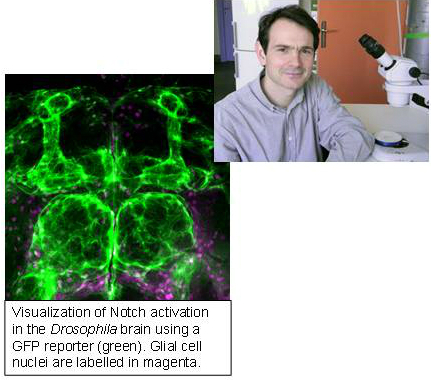 I then did my postdoctoral training in the laboratory of Michael Bate (Cambridge University) on the development of neuronal circuits, and in the laboratory of Paul Shaw (Washington University School of Medicine) on the molecular genetics of sleep in Drosophila. I worked for one year in the laboratory of Thomas Préat (ESPCI, Paris) on the link between sleep and long term memory, before joining my current position. Dissel, S., L. Seugnet, M. S. Thimgan, N. Silverman, V. Angadi, P. V. Thacher, M. M. Burnham and P. J. Shaw (2014). "Differential activation of immune factors in neurons and glia contribute to individual differences in resilience/vulnerability to sleep disruption." Brain Behav Immun. pii: S0889-1591(14)00472-3. Le Glou E, Seugnet L, Shaw PJ, Preat T, Goguel V. (2012) Circadian modulation of consolidated memory retrieval following sleep deprivation in Drosophila. Sleep 35:1377-1384B. 2012. Seugnet L., Suzuki Y., Thimgan, M., Israel, S.L., Duntley, S.P., Shaw, P.J. (2009) Identifying sleep regulatory genes using a Drosophila model of insomnia. J Neurosci. 29, 7148-57. Seugnet L., Suzuki Y., Vine L., Gottschalk L., Shaw P.J (2008) D1 receptor activation in the mushroom bodies rescues sleep-loss-induced learning impairments in Drosophila. Curr Biol. 18, 1110-7. Seugnet L., Botero J., Gottschalk L., Duntley S.P., Shaw P.J. (2006) Identification of a biomarker for sleep drive in flies and humans. PNAS, 103, 19913-8. Dernière modification le Vendredi 19 Juin 2015 à 02:08:07.